At the end of the last post Bubba parked the car with others belonging to people who drive like him. 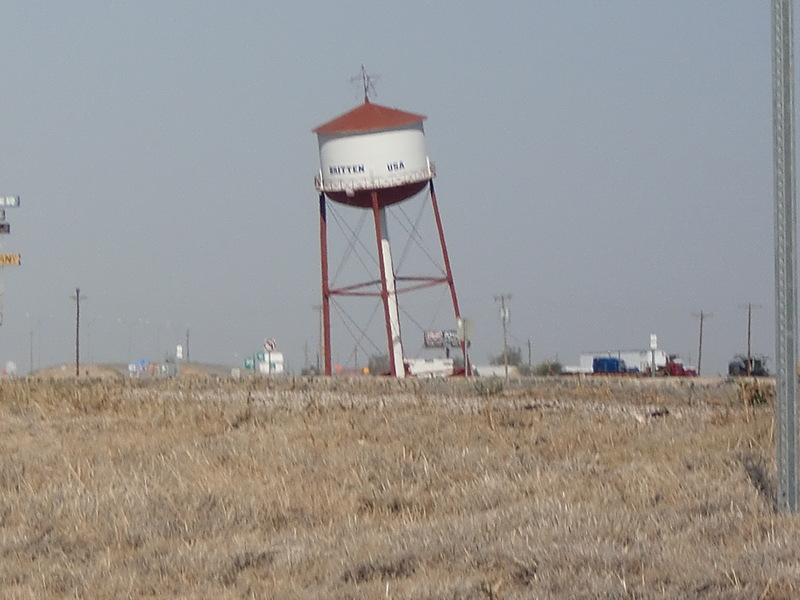 When we started out in the morning, he backed into one of the legs of the water tower. We decided that it was time to get out of town. 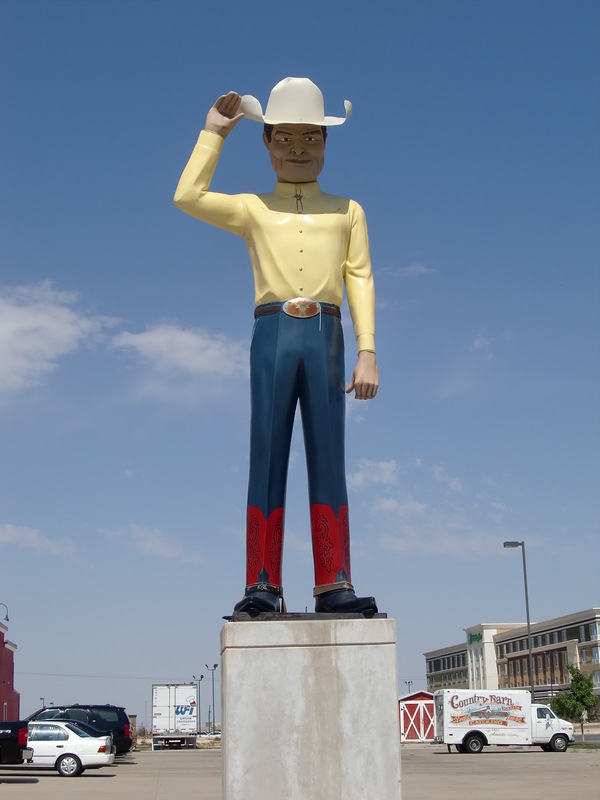 Passing through Amarillo Texas, we were told we had to visit a Big Texan. “A big Texan what?” I asked. 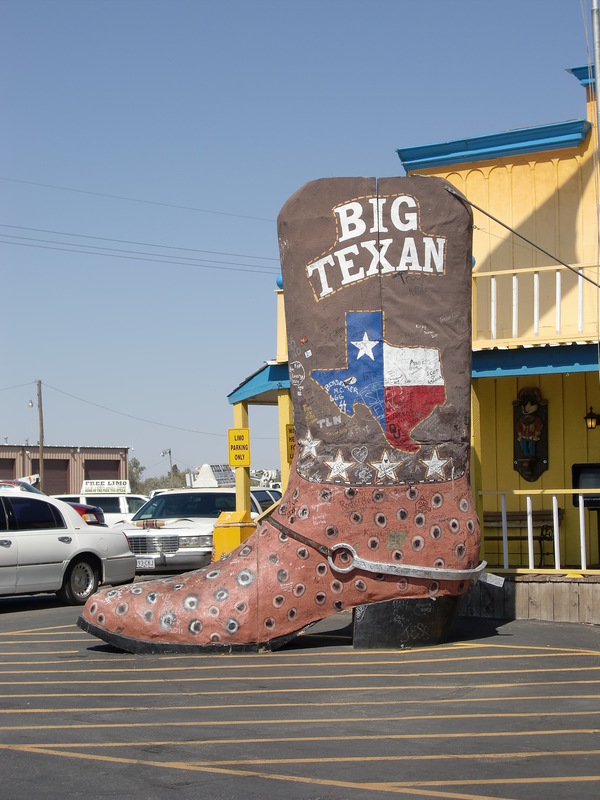 We found a Big Texan Boot. We found a Big Texan Cow. 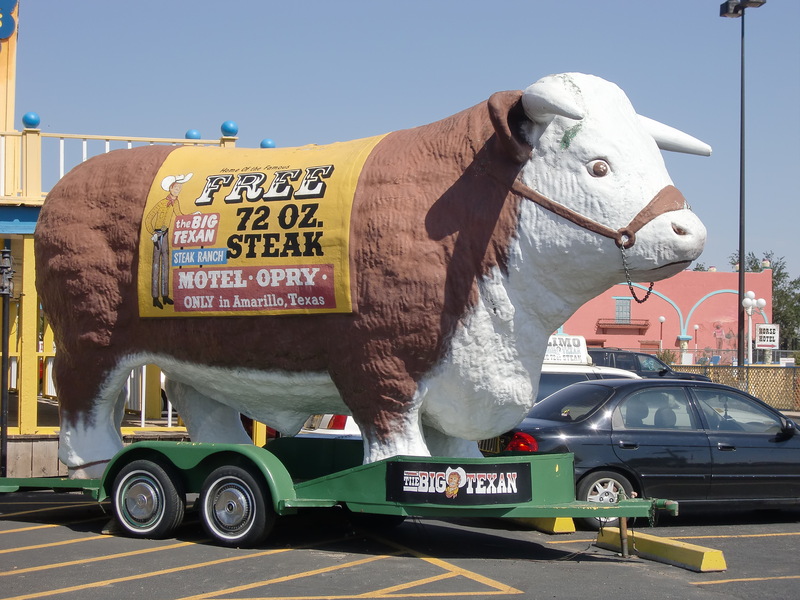 You could get a free Big Texan Steak if you wanted to fight the cow for it. This guy claimed to be The Big Texan but the lace cuffs on his pants made me suspicious. He claimed they were painted on boots and that made things sooo much better. 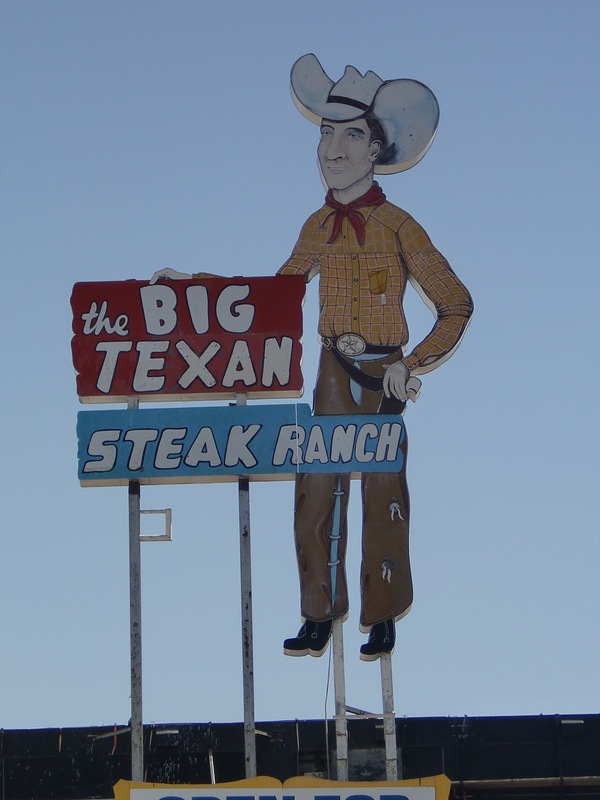 Finally, finally we found the real Big Texan. He treated us to a 72 oz. steak from The Big Cow. 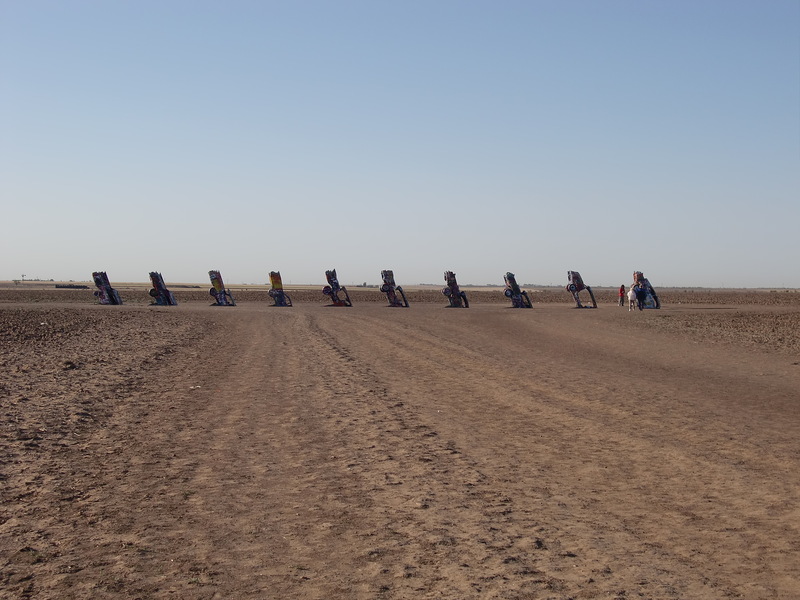 Just outside of town we found this interesting natural rock formation in an empty field. 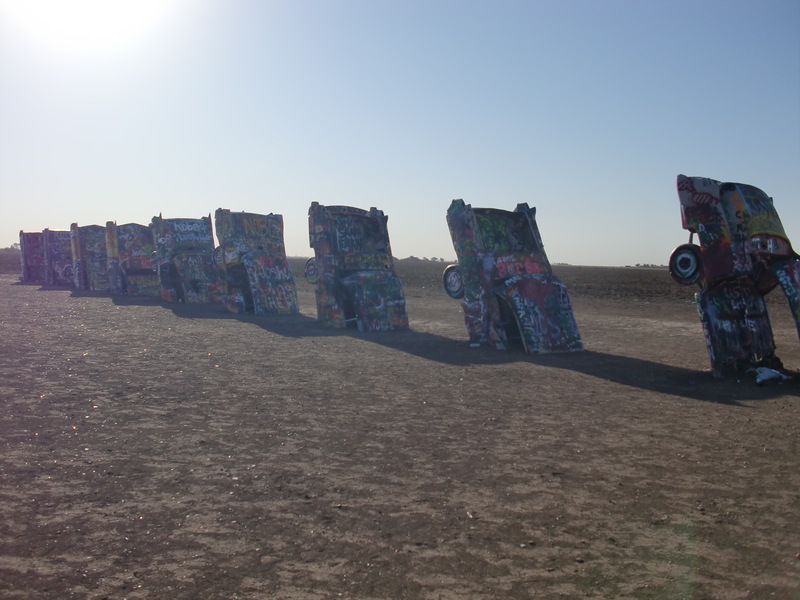 As we got closer we saw that it was some more of that Big Texan Parking. This time it was with Cadillacs. They have a vehicle placement problem here. I don’t know who did the tagging. 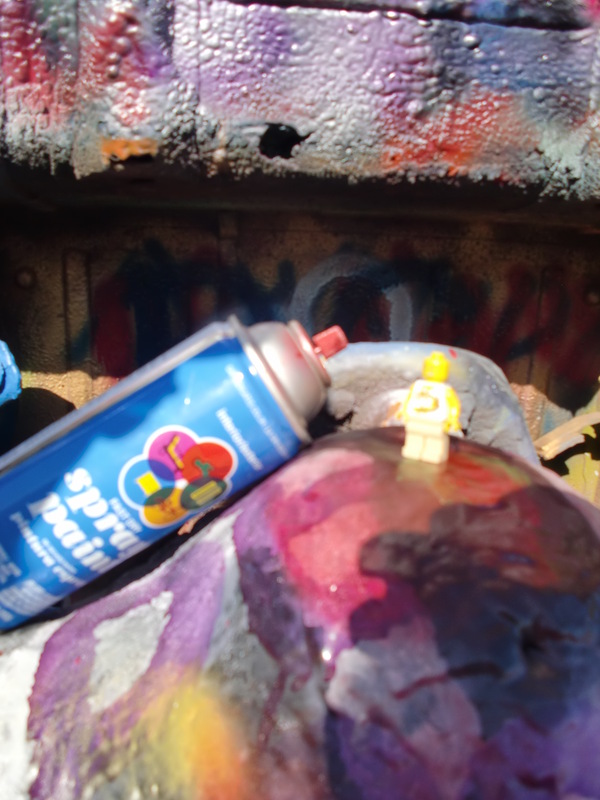 There was a security camera nearby; maybe they got a photo of whoever did the spray painting. We briefly considered stopping here for the night. We found a fabulous hotel. It had 50 rooms but only 40 were fabulous enough. 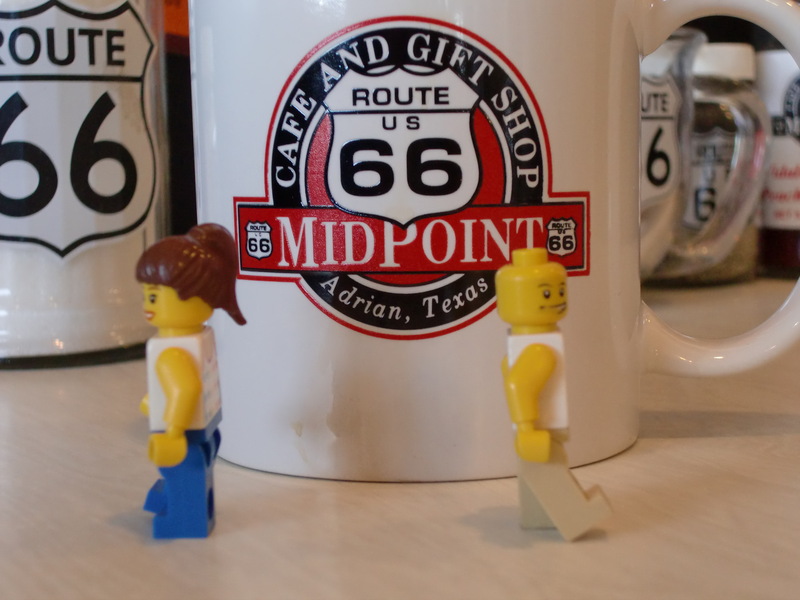 Instead we continued on to the town of Adrian, our last Texas stop and the midpoint on our journey. As you can see, the whole town turned out for our arrival. I had a decision to make. I really wanted to see my mystery friend, Millie. Was she ahead of me? Was she behind? Which way to go? I made a decision…this way. Maybe I should have gone the other way. 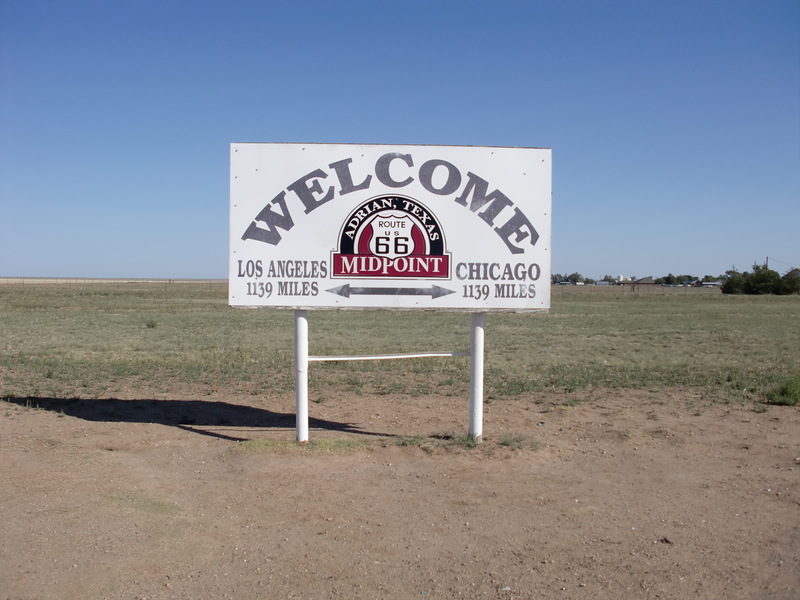 We crossed into New Mexico and stopped at a place to do a little shopping for luxury items to bring back to our friends. It was time to stop and settle in. We had a choice. This first place we looked at advertised “Squeaky Clean Rooms”. Instead of a pool, they had a sand box to play in. 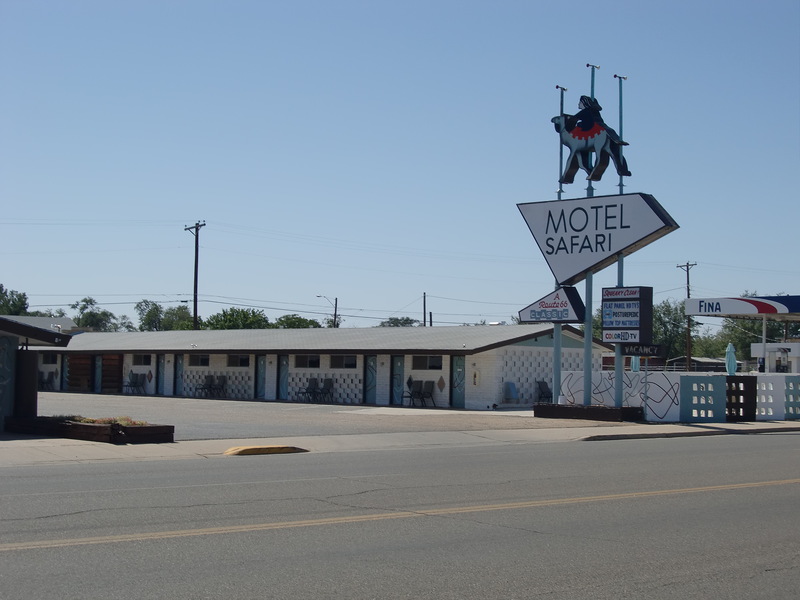 The name may have been a little misleading since, in my mind, a safari conjures up visions of a lush jungle. I had not seen a whole lot of foliage around here, lush or not. 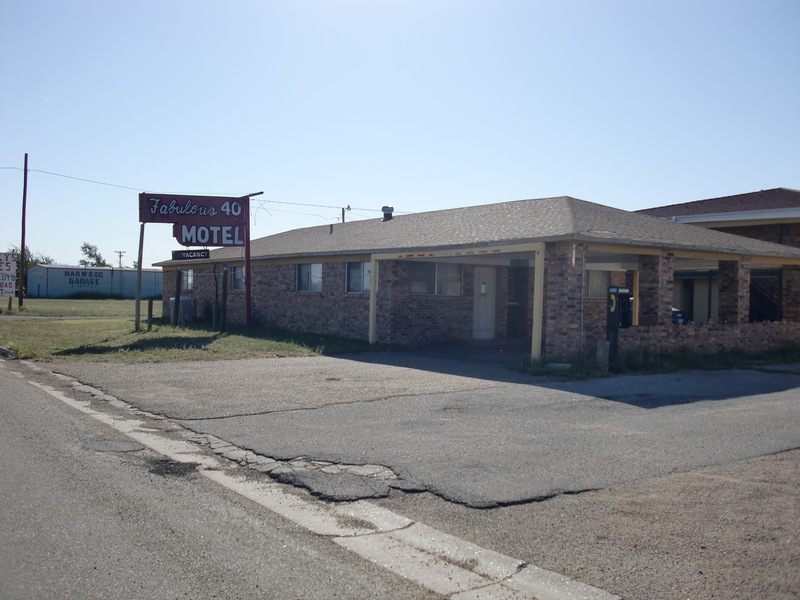 This place looked a little more inviting. It had Refrigerated air. Not just some of it, but 100% of it. 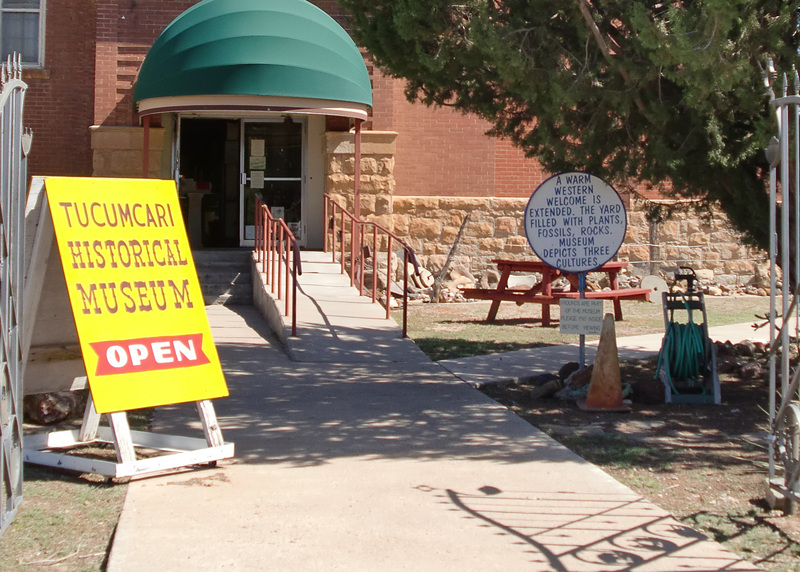 In one of the highlights of our trip we were able to see the Tucumcari Museum whose grounds had, the sign claimed, rocks and plants. 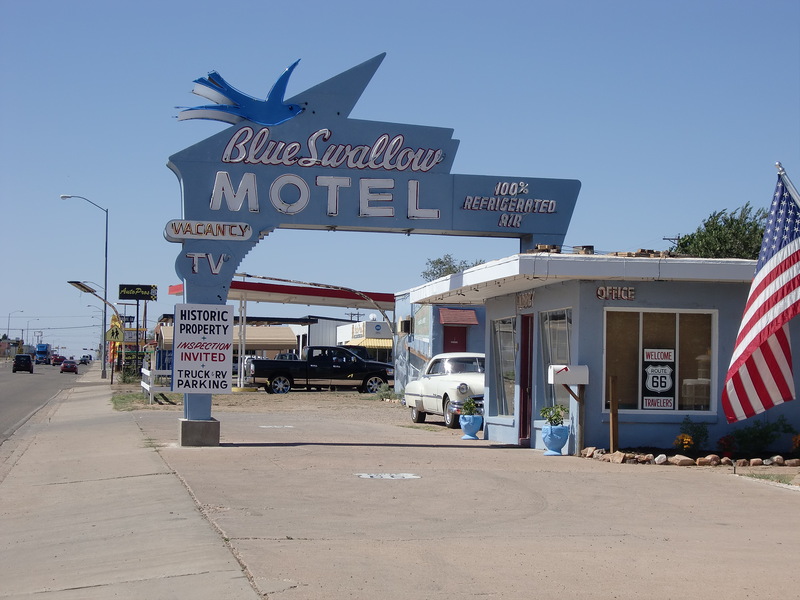 It was actually a very nice slice of life from a small desert town. We have been told that the road “has issues” ahead. We will leave that for next time.